Curacao visitors are often startled by how different this destination is compared to notions one might have regarding a typical Caribbean island. Curacao’s capital city of Willemstad looks like the founding fathers were given a helping hand by the makers of Crayola crayons. The vertically inclined buildings lining Willemstad’s harbor are awash with every color of the rainbow. The story behind what turned Curacao into one of the world’s most vibrant architectural destinations is either a grand tale or accidental grand planning. It is believed that Governor General Albert Kikkert, Curacao’s man in charge during the early 1800s, suffered from migraine headaches. Kikkert was convinced that Willemstad’s buildings, which were stark white at the time, contributed to his aching head. Kikkert felt that on sunny days the reflection on these pale buildings were not helping his condition. 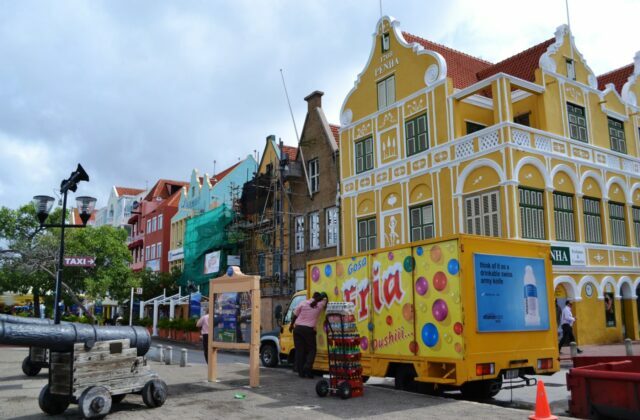 Kikkert gave an official order to paint the buildings throughout Willemstad’s downtown area. Kikkert’s medical condition of yesteryear turned Willemstad into the major tourism attraction it is today. The Caribbean moral of the story could be: The next time your forehead starts to pound, grab a paintbrush.